When I think of the pound-for-pound greatest fighter in the world, yes Anderson Silva comes to mind. Heavyweight fighters are more than just the biggest weight class; they are the pound for pound baddest dudes on the planet. There isn’t much of an argument needed to prove that. When Junior Dos Santos and Cain Velasquez step in to the Octagon at UFC 155, it’s important to realize, those are the two men on the planet at this moment in time who are at the top of a weight class of men that are the biggest. They can’t be out matched by size like the lower weight classes, and no one can argue the level of danger added to their bouts when only four ounces of material hover in front of each other’s faces. Let’s face it, when the big men get in the cage, rarely do they go to a decision these days. That’s combat at the highest level my friends. I’m not a fan of the Ultimate Fighter (TUF) reality show and I probably never will be at this point, but I will watch Shane Carwin and Roy Nelson in the TUF 16 finale throw down. I remember when Joe Rogan talked about sitting cage side when Shane Carwin was ground and pounding Neil Wain at UFC 89. Rogan marveled at the jawing sound made by Carwin’s fists as he dropped bombs in to the canvas all around Wain’s head. #1 When I look at the state of the heavyweight division these days, only a few of the men currently ranked really stand a chance at dethroning the champ in my opinion. Junior “Cigano” Dos Santos (15-1) turns the bodies of his opponents off with one hit lights out power in either hand. It’s really something else to witness and ironically, he couldn’t be a more caring and well-spoken individual. Just don’t accuse him of being afraid of you. #2 Cain Velasquez (10-1) will have his chance at taking his belt back from the only man to defeat him, in the current champ Dos Santos. These two are the best in the world and according to John Fitch and others in Velasquez’s camp, he was fighting injured the first time around. Velasquez has a dynamic wrestling style that has not allowed any opponent to stop his takedowns and vicious dirty boxing he adds to his grappling repertoire. Unfortunately he didn’t find an opportunity to implement his patented fighting style before Dos Santos knocked him unconscious last time so it will be interesting to see his strategy this time around against the man who took his belt. 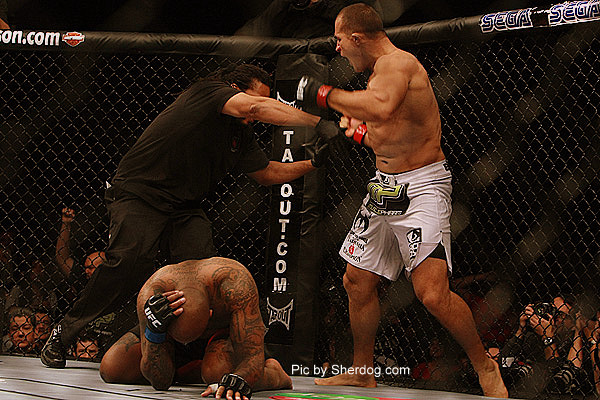 Watch the poetically rendered preview of Junior Dos Santos vs Cain Velasquez 2 in the video below. Video courtesy of the UFC and fueltv..
#3 Shane Carwin (12-2) holds the third spot as a serious gate keeper among the top list of competitors. He may not have looked good at all against Dos Santos but I doubt anyone below him on this list could replicate the champ’s success at out boxing Carwin. Back from back surgery, Carwin will probably destroy his undersized opponent in Roy Nelson at TUF 16 finale. After that he will be a great test for anyone who thinks they are ready for Dos Santos, of which is a tall order to fill. #4 Alistair “The Demolition Man” Overeem (36-11) may not have lost since his pride days in 2007, but he only has won once in the UFC against Brock Lesnar at UFC 141 and he will be facing the toughest fight in his career regardless of who leaves the Cage as the heavyweight champion between Dos Santos and Velasquez in December. He’s no easy challenge as he poses the most dangerous striking skills in the UFC since becoming the first MMA fighter to hold multiple titles in major combat sport promotions when he captured K-1 Kickboxing Grand Prix Tournament Title in 2010, while holding the belt in MMA’s Strikeforce and Dream organizations as well. I’ll still have to see him defend take downs against Velasquez, stop Dos Santos from out boxing him, or at least defeat one top five UFC heavyweight competitor before I’ll put him higher on the list like so many others have done. #5 Another man that needs to string a few wins under his belt in the UFC is none other than the current Strikeforce Heavyweight Grand Prix winner in undefeated Daniel Cormier (10-0). His stake in the heavyweight division is interesting since his build and size is more fitting for the light heavyweight division. He even has stated he will probably meet Jon Jones at some point in his career at the lower weight class. Either way he has one more fight on his Strikeforce contract, unless of course Strikeforce folds as rumored these days. #6 Fabricio Werdum (16-5) has been on a tear in the UFC with two strong wins against Roy Nelson and Mike Russow, combined with his impressive 3-1 record since leaving the UFC after a spoiled welcoming knockout loss to newcomer at the time, Junior Dos Santos. Werdum may be the first man to defeat “The Last Emperor” in Fedor Emelianenko, but his striking may have not evolved far enough to give him a nod at a chance at beating any of the men ahead of him on this list. With a KO loss against Dos Santos and a decisive loss to Overeem, he simply isn’t well rounded enough for a title shot anytime soon. #7 Stefan “The Skyscraper” Struve (25-5)has been fighting professionally since the tender age of 17 and has grown up a lot in the fight game right before our eyes. Currently riding a four fight win streak and, he has tasted devastating defeat in the past and seems to have finally overcome the power curve and cemented himself as a serious contender to not be underestimated or over looked among the heavy weight contenders. In a division where the big men fall fast, here are the stragglers who make the last few spots on my list. Even though some may giggle at my choices, I still think these three are holding on to contendership, even if only by a thread.